Ruling families in the late 19th century, it seemed, had a habit of building modern palaces at great cost. These were to replace their traditional castles, but they completed them just before they lost their crowns altogether. The “Summer Palace” of the last Emir of Bukhara is one such building. While far more modest, it reminded me of the Dolmabahçe Palace in Istanbul. A few architectural details echo Bukharan buildings, but most are Russian. The last Emir was a close friend of the Czar, trained with him in the military academy in Moscow and fell in love with the Czar’s sister. The decorations rotated with the seasons, even involving changing the wall panels in one major room. The fall panels remain today from when the Red Army arrived in September 1920. The Emir fled to Afghanistan. 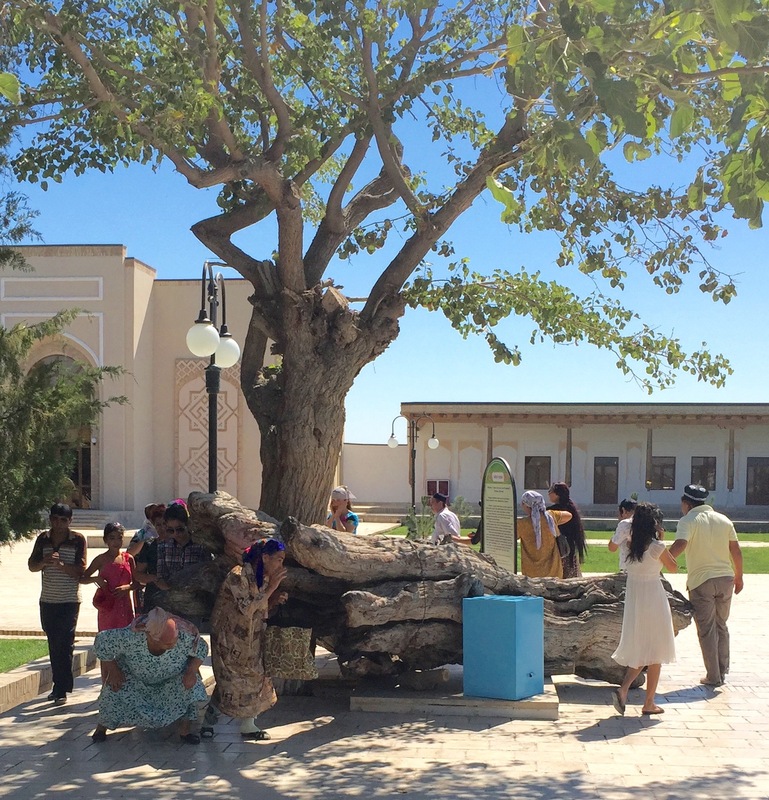 Contrasting politically, though also evocative of the tragedies of the early 20th century in this region, we also visited the family home of the head of the first communist revolution in Bukhara, Faizullah Khojaev. He was the son of a wealthy merchant who felt his city was backward and needed become more egalitarian and modern. He became the head of the Bukharan People’s Republic, then joined the leadership of the Uzbek SSR. Eventually, though, Stalin had him killed in the purges in 1938. There are a smattering of women dressed in brightly colored hijab, and a few older men wearing traditional caps. I was curious that the huge Jummah mosque was built in 2007-08 – I wonder what the story behind that is. There is a lively tradition of drinking – we went to a beer hall reminiscent of Eastern Europe, and apparently beer mixed with vodka is a popular drink. So the Islam at least of Tashkent seems to be a watered down (or ginned up?) version. Tashkent holds one of the oldest Qur’ans in the world, but alas for no clear reason the library holding it was closed today. I’ll have to satisfy myself with the images online. The history of the statue in the main square is the history of the area in the 19th and 20th century. The first monument was to the Czarist governor general Von Kauffman. Then after the revolution came an image of a Red Pioneer, to be replaced by a hammer, sickle and cannon. A statue of Stalin rose in the 30s and fell in the 50s, to be replaced by a triptych of Marx, Engels and Lenin. Most recently after the fall of the Soviet Union Timur on his horse took the place of honor. 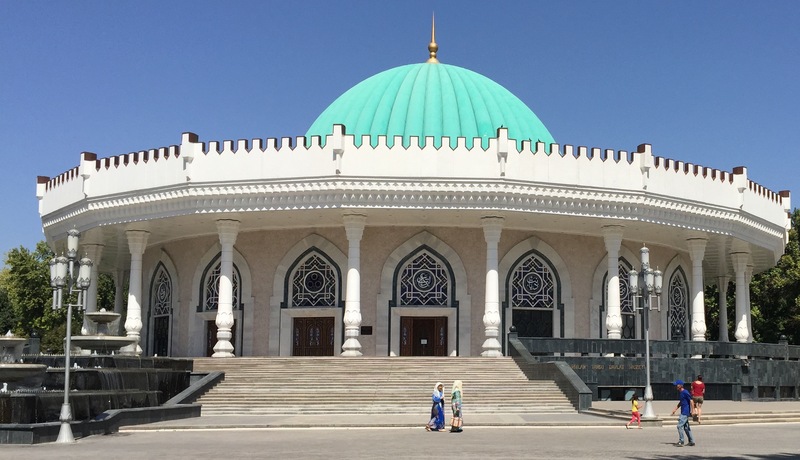 For a dictatorship, there is absolutely no cult of personality – I have seen no picture of the president for life yet (though on our train ride to Bukhara, a poster had some saying attributed to him). Police presence appeared minimal, though once we saw several men in gray camouflage who our guide identified to us as from the ministry of the interior. Oddly, though, our bags were searched when we entered the subway. Apparently this is not always the case, but independence day is coming up…in a month! The script is slowly changing. When the Russians took over from the Ottomans, they replaced the Arabic script with Cyrillic. Now the Cyrillic is slowly being replaced by the Latin script – we were told that school kids now cannot read the Cyrillic script well. 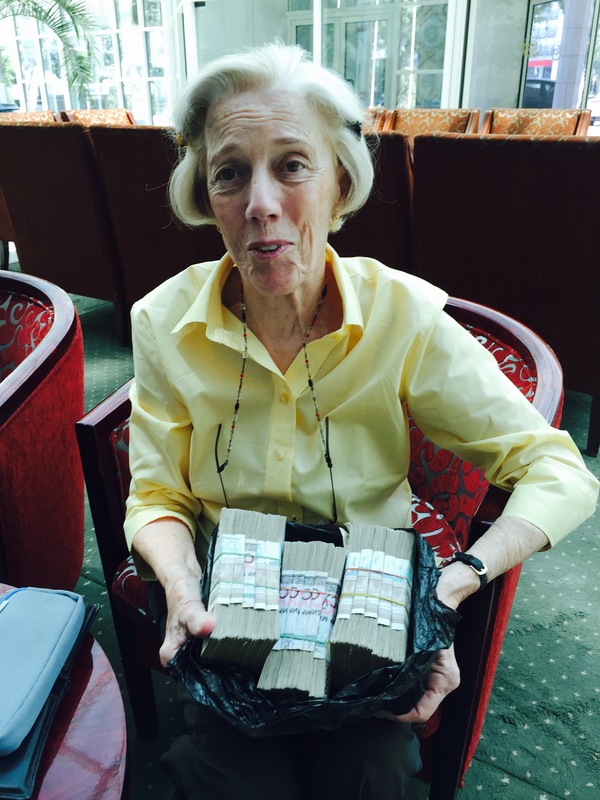 The Uzbek currency is totally unwieldy – their largest bill is 1000 soum, which is worth at the moment about U.S. 25 cents. Thus, to pay for a delicious dinner for four people plus wine, $51, took more than 200 bills. We had stacks of bills in groups of 10 on the table counting out our payment! Several markets were very lively, though alas set in or around socialist 20th century buildings. Most of the areas we visited were fairly empty – probably most people were working, and it is quite warm during the summer. We exchanged money through an acquaintance. As he explained, 2550 soum to the dollar is the official rate. The safe rate (he goes to an apartment of a friend he trusts) is 3800 – $1. On the street you could get 4000 – $1, but it is not safe. We had to give him new $100 and $20s. The $20s had to be crisp and not after 2003. Also interesting – he speaks only Russian and English. He’s born and raised in Tashkent, and when he was in school (though he seems like he would have been in school after 1991) they were teaching in Russian. 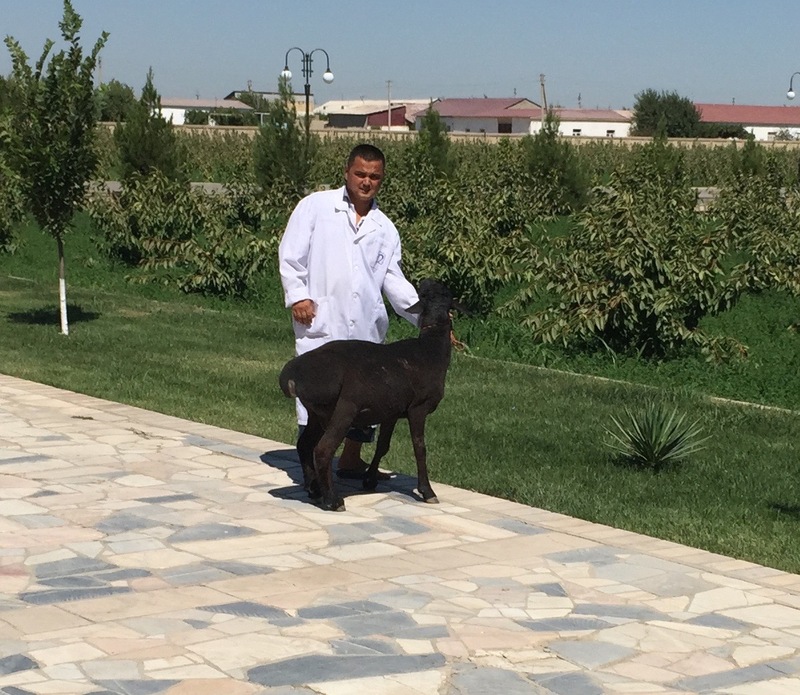 He knows enough Uzbek for the market. 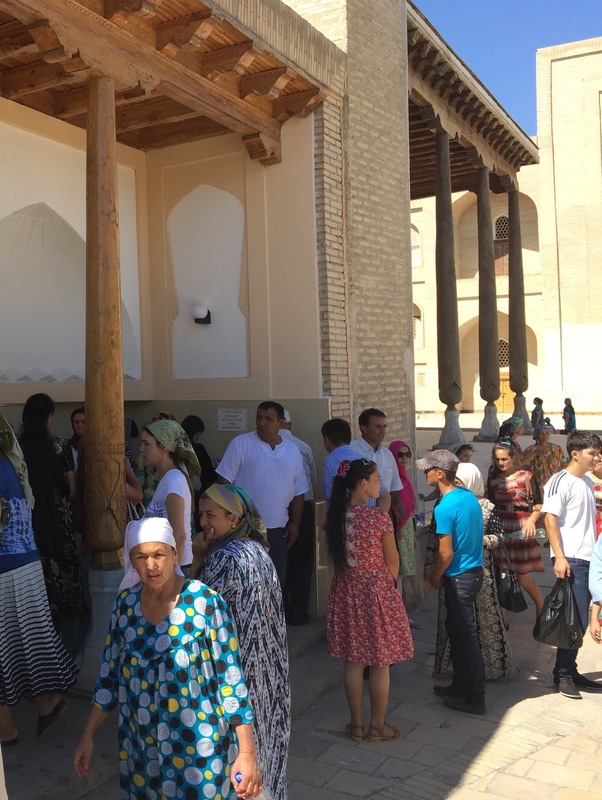 Now, he says, more Uzbekis know Uzbek, though everyone in the cities still knows Russian. 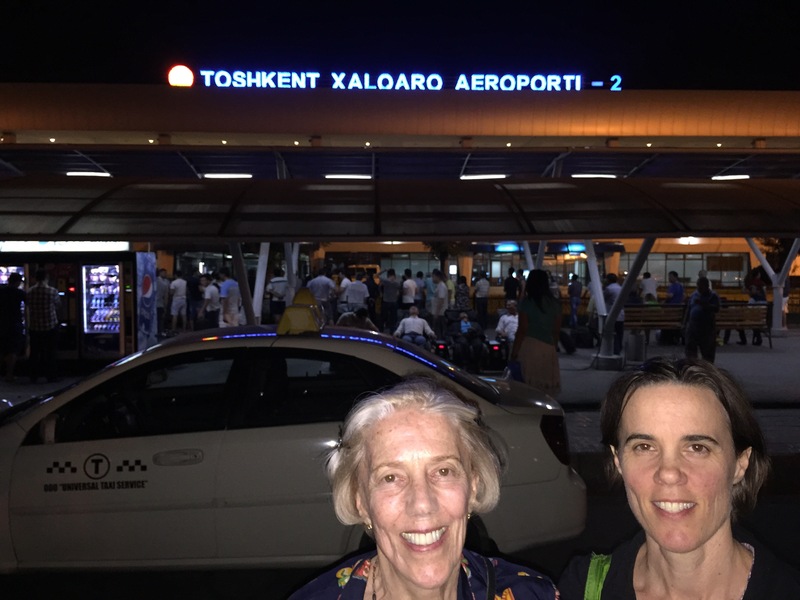 Last night, after arrival into a mid-size airport that functioned fairly well and that kind of a drive through empty streets where you try to get a sense of the city in a jet lagged blur as it zooms by, we got to bed around 4am. I hit the ground running at 7am with a visit to the City Palace Hotel’s exercise area. I came down from my 11th floor wood paneled room. They had a serviceable room with two treadmills, some weights and a stationary bicycle. The steam room was small and beautifully tiled, and I would have tried to capture some of the sense of a hamam except that it was the hottest steam bath I had ever been in! A quick stop in the sauna and some laps in the pool completed my gym journey. Breakfast in the surprisingly cheerful and reasonably sized coffee shop. Overall, I get the sense that someone with moderate aesthetics, taking a signal more from a nice Hilton than from the empty and grand monstrosities of the old Soviet empire, built this hotel. Most of the streets are very modern. People that I see so far look generally white, along the same spectrum that white folks in the U.S. would look. 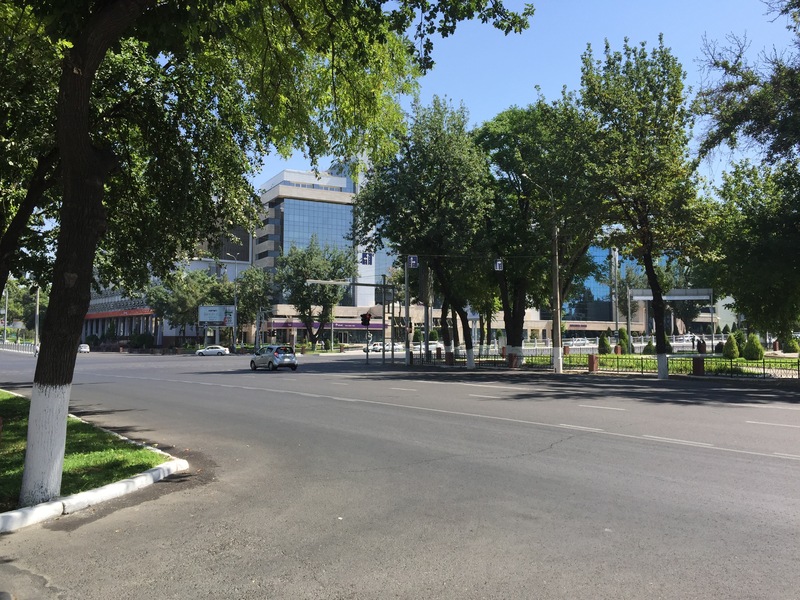 They don’t appear central Asian – well some do a little bit – is this a city vs country thing? The good morning greeting is “Salaam aleikum.” Neither last night at the airport nor today at the hotel do I see anyone in any form of traditional dress. 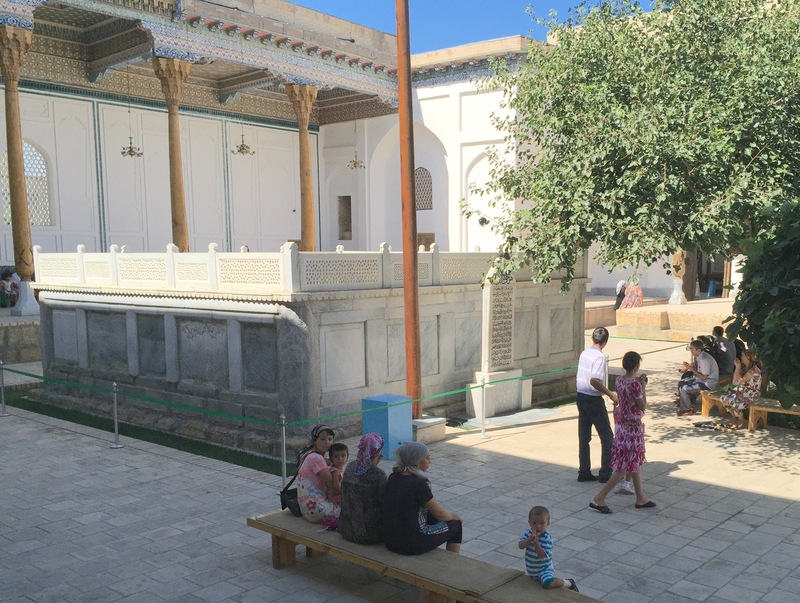 A quick walk next door to the Timur Museum did reveal two women in brightly colored hijab. The young men hanging around the lobby of our hotel are wearing football (soccer) polo shirts and either shorts or slacks.